We are between two Thanksgiving seasons here in North America; Canada celebrates the harvest season holiday weeks before our neighbors to the south but we both eventually need help getting rid of all that leftover turkey. I have a whole collection of leftover turkey recipes that you can find by clicking here. This delicious recipe was the result of a little post Thanksgiving experimentation but it could be enjoyed year round with leftover chicken or even diced grilled chicken breast instead of leftover turkey. 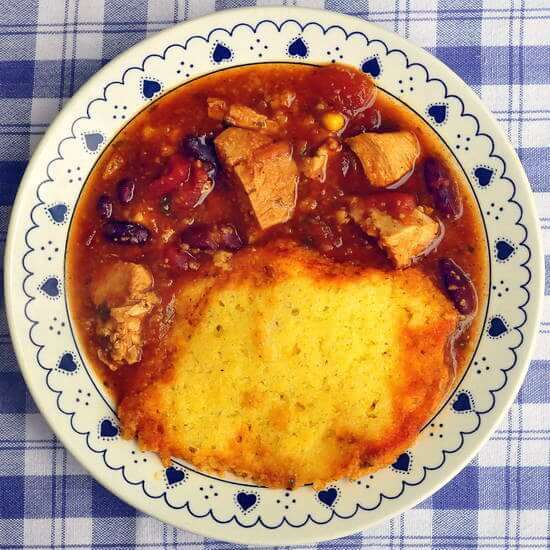 The idea comes from slow braised beef chili that I make in the oven and then sometimes add cornbread dumplings in the last half hour or so. You can use the same concept here and omit the stock at the end to make this as a chili rather than a soup too; it’s terrific either way. Soak 1 to 1 ½ cups dry 5 bean mix beans overnight, depending on the amount of beans you prefer in your chilli. You may use canned beans if you prefer. In a large saute pan heat 3 tbsp olive oil. Cook until the onions begin to soften, then transfer to a covered roasting pan. Return to the oven while you prepare the cornbread dumplings. Fold in the dry ingredients. Drop by heaping spoonfuls onto the surface of the hot soup, cover and return to the oven for about 25 minutes or until a toothpick inserted into the center of one of the dumplings comes out clean. Previous Post: « Maple Apple Cheesecake – so lusciously creamy!